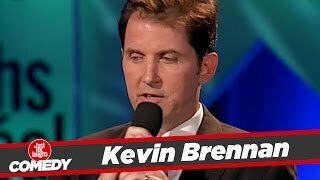 Kevin Brennan was born in Chicago, Illinois to Charles and Ethel Brennan (his parents requested that we not use their real names to protect their identities). Brennan (although I"m writing this myself I"m using the 3rd person to pretend I paid a fancy publicist to do it) is one of the country"s top comedians. He was voted "Best Comedian" at the 2005 Aspen Comedy Festival which led to him taping his own HBO half-hour comedy special. Brennan started his career in Chicago but soon relocated to New York City to pursue his dream of being on the "Late Show with David Letterman." He nailed his first Letterman set which led to bookings on "Late Night with Conan O"Brien" and "Last Call with Carson Daly." Brennan is a former writer/performer on "Saturday Night Live." He recently taped a pilot for NBC called "Number One Son." Kevin is one of ten children and became a stand-up comedian because he didn"t get enough attention as a child.